Human Culture: An Evolutionary Force: Infectious disease? No Worries. Let's domesticate those germs! Infectious disease? No Worries. Let's domesticate those germs! Over the last few decades, when thinking of addressing harmful infectious diseases such as Cholera, we often turn to pharmaceutical drugs to solve the problem. However, in recent times, researchers have started to question the effectiveness of this method in combatting infectious diseases. This is because while drugs can help our body combat and recover from diseases, they can be extremely costly to design and produce. Additionally, drugs can potentially facilitate the emergence of drug-resistant strains of infectious diseases, as my fellow contributor Nkemji Nweke points out in her blog post. In other words, our reliance upon drugs are in fact making these harmful infectious diseases hardier in the long run. This is fundamentally problematic! In light of this issue, evolutionary biologist, Dr. Paul Ewald started to wonder: Instead of using drugs that can potentially make these bacteria more harmful over time, how can we use the theory of evolution via natural selection to make these harmful organisms more benign instead? In other words, how can we introduce a selection pressure that selects against the more toxic strains of the harmful organisms? To answer his question, Dr. Ewald turned to investigating whether we can introduce a selection pressure against the more toxic strains of Vibrio Cholerae, which is the bacteria that causes Cholera. Cholera is an infection of the small intestines that often lead to diarrhea. Cholera can spread via three ways. Person to Food to Person. Transmitted through the infected water systems. The key difference between these three methods is that the third method does not require the infected individual to be mobile. Since mobility of the infected is not required to spread the disease, studies have found that bacteria strains that spread through water tend to be more toxic and harmful. Based on this understanding, Dr. Ewald hypothesized that one way to introduce a selection pressure against the more toxic strains of Cholera is to remove the bacteria’s ability to spread via water. This can be done by introducing clean water ways where people would have access to not only clean water, but also stay protected from unsanitary sewage. With the introduction of clean water systems, the only way in which Cholera can spread is through either method 1 or 2, where each requires the bacteria to be less toxic so the infected individual is able to remain mobile. 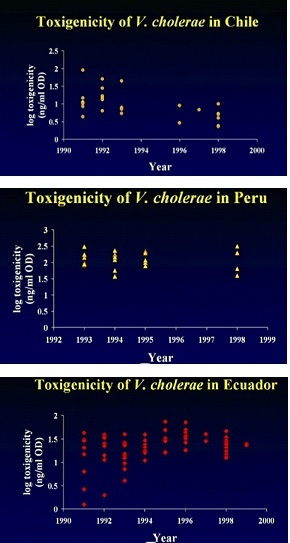 To test his hypothesis, Dr. Ewald looked at three countries in Latin America that were affected by the 1991 Cholera epidemic (Peru, Chile, and Ecuador). In this research, Dr. Ewald wanted to see if the standard of the water system in each of the countries influenced how the Cholera bacteria evolved. The results of his study yielded very interesting results. The bacteria strains in Chile, home to one of the most well protected water ways in Latin American, evolved to be much milder in a few years. On the other hand, the bacteria strains in Ecuador, which has one of the least protected water ways, actually evolved to become much more toxic. Peru, being in the middle in terms of its water systems, saw no change in the bacteria’s toxicity. In another similar study, Dr. Ewald once again compared the toxicity of the Cholera bacteria strains that were found in different places. Sure enough, the results were similar. The greater the proportion of the population having access to clean portable water regions, the less toxic the Cholera bacteria strains were. All in all, the results from Dr. Ewald’s studies tell us one thing: we actually have the ability to “domesticate” harmful diseases by changing our living conditions so that the new conditions actually select against the more harmful strains of the infectious bacteria! This finding is not only highly fascinating, but also very important. This is because Dr. Ewald has demonstrated that sometimes using natural selection as a force to tackling infectious diseases might be a much better way than traditional drug research! Perhaps it is time we start re-evaluating the ways we combat infectious diseases. Perhaps it is time we start “domesticating” germs. Ewald, P. 2002. Plague Time: The New Germ Theory of Disease. Knopf Doubleday Publishing Group. Faruque, S. M., Albert, M. J. and Mekalanos, J. J. 1998. Epidemiology, Genetics, and Ecology of Toxigenic Vibio cholerae. Microbiol Mol Biol Rev. 62(4): 1301–1314. TED Talks: Paul Ewald asks, Can we domesticate germs? 2008. TED Conferences, LLC. http://www.ted.com/talks/paul_ewald_asks_can_we_domesticate_germs.html. Accessed 21 Feb 2013. How effective do you think 'domestication' of germs is in fighting infectious disease by itself? i think that it is actually very effective. This is evident from the latin america vibrio outbreak. as described in my post, you can see that by just having different standards of water treatment systems, the toxic levels of the vibrio strains in Chile and Ecuador underwent observable changes in just a few years. This is actually is pretty amazing. Additionally, Dr. Ewald actually also provides many other real life examples in his book, such as addressing malaria, which demonstrates the effectiveness of "domesticating germs!" Drug therapies, immune stimulation through vaccines and targeted immune response, and infrastructure improvements which limit disease mobility in combination form a potent method for limiting the spread of infectious disease and reducing its lethality. I agree with you, Ben K. I believe that finding the perfect balance between drug/vaccination therapies and "domestication measures" can potentially be the key to addressing majority of the infectious diseases that plague our world today. This is an interesting idea that has the ability to revolutionize the way we treat infectious diseases. I can only hope that there will be more studies like this in the future that will help us further understand how evolution can be used to "tame" other diseases like HIV or malaria. I hope there will be more studies on this topic too! It is interesting how you mentioned about HIV and malaria in your comment. Dr. Ewald actually spent a some time talking about how we can "domesticate" HIV and Malaria in his TED talk. You should definitely check his talk out! If one were to know the exact conditions that would deplete a certain bacteria and implement it effectively as shown with the cholera, it could be revolutionizing. It's only a dream, but it would be so great if this type of thing were possible with illnesses not caused by bacteria, such as cancer. Yes, I wish that we could do this type of thing for cancer too. But let's stay positive! You'll never know! I think that this is a good idea. Having clean water is such a big issue throughout the world. By changing living cultures, scientists can see how bacteria is affected and what causes more mutations. I hope there are more studies like this in order to see how far research can go. I just came from Rita Colwell's talk on Cholera, what a coincidence! This post really parallels her talk. She also stressed the importance of access to clean water to prevent cholera pandemics. She didn't throw in the evolutionary aspect of it, so I appreciate your post tying in her talk with evolution. Thanks Rande! I really like your post on the Twa people by the way. It was a really refreshing read. Actually, my senior thesis is also on vibrio. I'm investigating to see how our act of dumping marine plastic debris into the ocean is actually causing vibrio bacteria living in the open ocean to evolve. I wonder how many different bacteria or viruses can be tamed to reduce their deadliness? But by making them less deadly and virulent does the fitness of the bacteria or virus decrease? And could another pathogen become more virulent and more deadly as a result of the lowered fitness of the tamed pathogen? I guess what I mean to say is, does something like HIV, (or other viruses or bacteria that have Humans as a host or apart of their reproductive lifecyle), have decreased fitness once they become tamed? And as a result of this decreased fitness could other viruses or bacteria become more virulent because their is less competition? So could a cycle develop where we tame something and another thing pops up to take its place? To answer your question, making them less deadly does not necessarily decrease the fitness of the bacteria. What it does is that it "forces" the bacteria to evolve to a form that is less harmful towards us humans. The only time where the bacteria will experience a fall in fitness is when it doesn't adapt to the new conditions we set for it. Either way, we benefit! To your second question, I don't think so. This is because in this "domestication" process, we are only focused on influencing the way bad bacteria and viruses reproduce via human transmission.